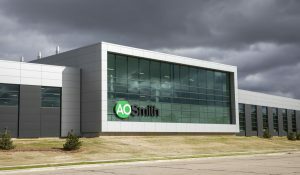 Milwaukee, Wis.— A. O. Smith Corporation (NYSE: AOS), today, celebrated the grand opening of its new Lloyd R. Smith Corporate Technology Center. The 42,700-square-foot research and development lab, located adjacent to the company’s world headquarters in Milwaukee, will serve as the company’s global innovation hub, where teams of engineers will concept, test and finalize core technologies to be used in A. O. Smith products around the globe. A. O. Smith’s corporate technology team – the team working in the new facility – focuses on advanced research and development in the area of potable and hydronic water heating, water treatment, and air purification. The new research center features water heating and boiler performance test labs, water treatment labs, an air test lab, as well as a number of specialized development labs. In addition, the new research center has a prototype lab where product prototypes, test fixtures and other equipment will be built. The new facility is named after Lloyd Raymond Smith who led the company for three decades in the early 1900’s and was responsible for some of the company’s most far-reaching technological breakthroughs, such as A. O. Smith’s proprietary glass-lining on water heater tanks. A. O. Smith Corporation, with headquarters in Milwaukee, Wis., is a global leader applying innovative technology and energy-efficient solutions to products manufactured and marketed worldwide. The company is one of the world’s leading manufacturers of residential and commercial water heating equipment and boilers, as well as a leading manufacturer of water treatment products. For more information, visit www.aosmith.com.